Not only does this make a fun decoration, but it is so cute and easy you might decide to put up several in your house. 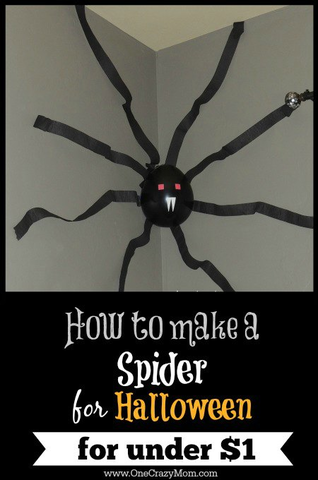 If you are throwing a Halloween party or simply decorating for the Halloween season, this spider is so fun and festive. No need to spend tons of money buying expensive Halloween decorations. You can make your own at home for very little money. Plus, these are not complicated. You will not spend hours putting these spiders together. They are so easy and simple to make. Once you see how little time and money it takes to make these spiders, I bet you will make these every year. In fact, the kids will probably request to help because it is just that fun and simple to do! This Homemade Large Spider Decoration took about 15 minutes to assemble and didn’t even come close to costing $1. You could easily make a handful of spiders for under a couple of dollars. 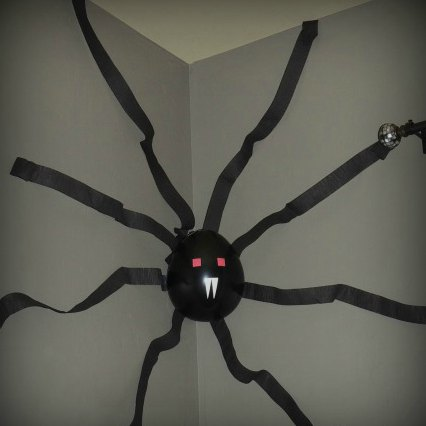 If you are looking to purchase a similar Spider decoration, instead of making one, you can find this Giant Hanging Black Spider from Amazon. You can choose from several spider decorations to purchase. However, it’s so easy to make your own and much cheaper. Let the kids help and everyone will have a blast. Making spiders for Halloween is so easy and fun! How about we just make it for $1 instead. 😉 Yeah! I’m all about saving money so this route works for our family. Plus, we really had a blast making these DIY spiders. Blow up balloon and use a few pieces of painters tape to secure to the wall. Tear a long strip of crepe paper. Secure one end behind the balloon, then secure another 3-4 sections of the crepe paper to the wall. You’ll want to leave sections loose so it looks like spider legs. Repeat the previous step 7 times. Cut out eyes and fangs and glue them to the front of the balloon and you are done! I told you it was going to be easy! How many spiders do you think you’ll put in your house for Halloween decorations this year? It truly is that simple! Give these Halloween spider decorations a try for Halloween. Homemade Giant Spider Decorations are so fun to make! If you are throwing a Halloween party, you might also like to grab one of these 20 Fun and Free Halloween Printables. Try making one of these 25 Easy Halloween Cupcakes Ideas. And keeping with the spider theme, you might want to make these Easy Spider Cupcake or Spider Pudding Pies. So fun! These treats will go perfectly with this Giant Spider Decoration DIY! You can also learn How to make and Decorate Ghost Sugar Cookies and how to make these Easy Halloween Treats for Kids- Ghost Twinkies. Yum! It’s amazing what all you can make. In fact, we prefer to make our things. I think the treats taste better and the decorations are way cuter. Plus, we save money which you all know is high on my list of priorities. It is a must! The best part is it cost me less than $1 to make this spider! If you are looking for more fun and inexpensive decorations this Halloween, don’t forget about our FREE Halloween Keep Calm Printables and 25 Frugal Halloween Craft and Game Ideas. There are so many fun and frugal ideas for Halloween! You will also want to check out our Homemade Halloween costumes for kids. Don’t forget to visit our Halloween on a Budget Pinterest board for more great ideas. Halloween spider decorations are budget friendly! Share your fun and frugal Halloween ideas with us. We are always looking for new ideas. Please share any ideas you have. We especially love frugal and simple ideas. Ideas that do not break the bank and take just minutes to make are the best. Especially if you have kids. I used to try to make all these complicated crafts when they were small. Trust me, I learned quickly and now it’s the simpler the better. Everyone is much happier that way! 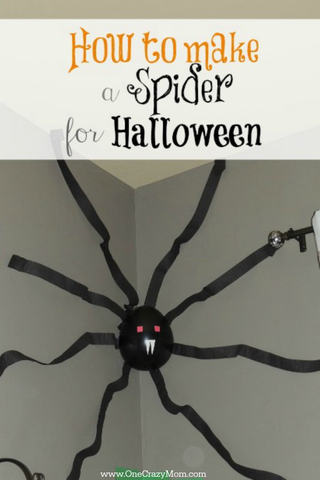 Your Halloween party will be the with this fun and easy black spider idea. The red eyes really add to it I think. I bet you could even make it with eyes that light up. Halloween decorations do not have to be expensive or complicated. Make a couple of giant spiders for a big impact with little money. I think it would be so cool to make several and put together giant spider webs. These black spider Halloween decorations are so cool. This scary spider is just what you need for your Halloween party. I did one last year and everyone still talks about the mega spider web. Make a few for outdoor decorations for the porch or patio garden and trick or treaters will love these creepy crawly spiders. If you need ideas for trick or treaters, I like these 20 Fun Non-Candy Halloween Treat Ideas. If you make a haunted house every year, these are perfect for Halloween props. So fun!! Halloween spider decorations are so inexpensive to make. I am always amazed at what we can come up with using a lot of what we have around the house. Sometimes, I think we complicate things when it takes very little to make an impact. Kid’s don’t need all these fancy things we buy or spend time on. Often the simpler the better. Come back and let us know how they turn out. I think everyone will not only enjoy making these but love how they look. We are always so pleased with how they turn out and this mama loves how little it costs. Yeah!